The Reflex-Korelle is a reflex camera made by Franz Kochmann, later Korelle-Werk, Dresden. It is one of the earliest 6×6cm SLRs. The Meister-Korelle is a postwar developement, also sold as the Master Reflex. Copies of the Reflex-Korelle were made in various countries, for example the British Agiflex or the Japanese Reflex Beauty. The camera takes 6×6cm exposures on 120 film. It has a focal plane shutter with horizontally running cloth curtains. There is a fixed waist-level viewfinder on top, with a matte screen and a magnifier. The viewing hood has an additional folding frame finder at the top. The camera is focused by turning the lens helicoid. It has a fine thread 41mm lens mount. The original Reflex-Korelle was introduced in 1935. Very early cameras were made with B, 1/10 – 1/1000 speeds, but this was quickly changed to B, 1/25 – 1/500. The lens mount is a simple screw thread with 40.5mm diameter. The Reflex-Korelle II, launched in 1936, has the addition of slow speed dial providing 1/20 to 2sec. and a self-timer. After the introduction of model II, the original model without slow speeds was renamed Reflex-Korelle I. Some sources say that the two models were modified in 1937 with auto-stop film advance, and renamed Ia and IIa. A simplified Reflex-Korelle B was sold at the same period, with separate shutter winding and film advance, and with no eye-level finder. 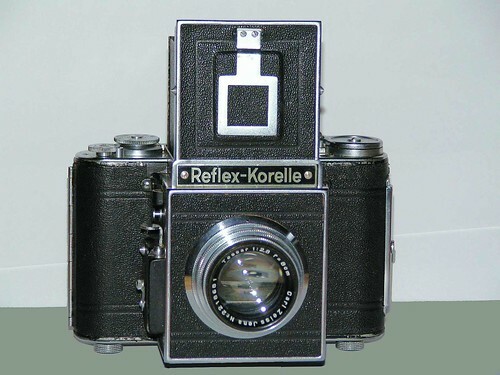 A new edition of the Reflex-Korelle II appeared in 1939 with a chrome finished top plate, replacing the IIa. The Reflex-Korelle III, released the same year, has chrome plating on the front plate and viewing hood, redesigned controls and speeds from 2s to 1/1000. It introduced a large-diameter bayonet mount, which was also fitted on some examples of the model II. After World War II, production of the camera was resumed in 1947 by Korelle-Werk, nationalized as VEB WEFO in 1948. The Meister-Korelle is a redesigned model, sold in the USA as the Master Reflex. It has yet another lens mount, with a large diameter screw thread. WEFO was merged into Welta in 1951, and the production of the camera lasted until 1952. ↑ McKeown, p.471. The revised version is called the "IA" in Matanle, p.215. ↑ McKeown, p.471. This is called the "IIA" in Matanle, p.215. ↑ McKeown, p.472, Matanle, pp.215–6. Matanle, Ivor. Collecting and Using Classic SLRs. London: Thames & Hudson, 1996. ISBN 0-500-01726-3. Pp.215–6. McKeown, James M. and Joan C. McKeown's Price Guide to Antique and Classic Cameras, 12th Edition, 2005-2006. USA, Centennial Photo Service, 2004. ISBN 0-931838-40-1 (hardcover). ISBN 0-931838-41-X (softcover). Pp.471–2 and 983. Reflex-Korelle listed at number 19 in Jason Schneider's Top 20 Cameras Of All-Time on Shutterbug.